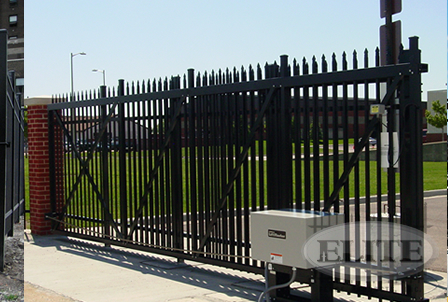 As manufactured by Elite Fence Products, Inc. shall conform to the following specifications: FS RR-191/2D Type III & IV and ASTM F 1184-88. Wall tube at 1.106# per foot diagonal brace for chainlink gates. 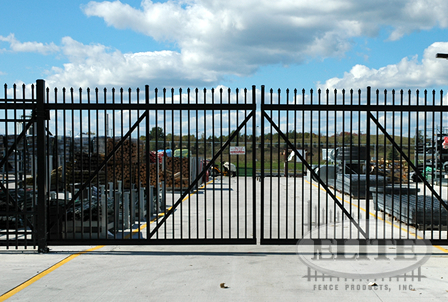 Gates made for chainlink may be shipped with the wire in place or the wire can be installed at the job site. The fabric shall be held in place by tension bars, tension bands and bolts. Barbwire shall be held in place by brace bands and bolts. The upper track will have holes punched to accepted 1" x 1" x .062 wall picket, the pickets shall be attached by using 410 stainless steel screws. The heads are coated with zinc and yellow chromate, and then painted to match the color of the gate. 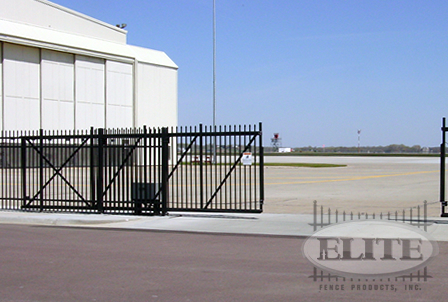 All gates are manufactured with no picket through bottom to meet UL 325. Two (2) swivel type truck assemblies consisting of a solid steel zinc plated body, utilizing a 3/4" mounting stud. Each having two (2) axles press fitted to the main body. The axles are then press fitted with four (4) permanently lubricated sealed ball bearing wheels mounted vertically for rolling the gate. Two (2) top mounted steel horizontal rolling wheels with sealed bearings are used for alignment. Two permanently lubricated sealed ball bearing wheels are mounted to the gate post and should be vertically centered in the lower track. 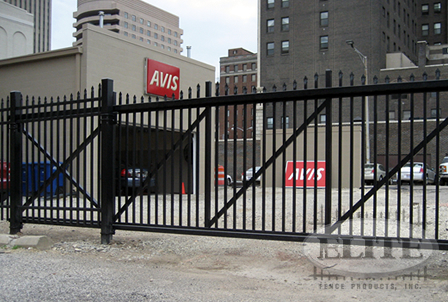 All brackets and gate latches shall be galvanized after fabrication.